St Mary’s Church needs to generate almost £90,000 each year in order to fund its running costs and its mission and outreach activities. The majority of this comes from planned and one off giving. Most parishioners and many other villagers like to support the work of St Mary’s Church through regular giving. The most convenient method for both the donor and the church is usually to set up a standing order from your bank or building society. However, regular churchgoers can choose to use weekly offering envelopes if they prefer, which are simply dropped into the offertory plate during the church service. Please follow this link to the Regular Giving Form, and don’t forget to complete the Gift Aid section if you are a UK taxpayer. The completed form should be e-mailed to the Stewardship Administrator and this e-mail can also be used if you have any questions about giving or gift aid. If you would like to make a one off donation to the work of St Mary’s Church you can either make a bank transfer to the bank account on the One Off Giving Form, or enclose a cheque payable to St Mary’s Church with the form and post it to St Mary’s Church for the attention of the Stewardship Administrator. A wonderful way of sharing with the village is to sponsor the church spire floodlighting, to celebrate an important birthday, wedding or anniversary, or remembering a loved one. 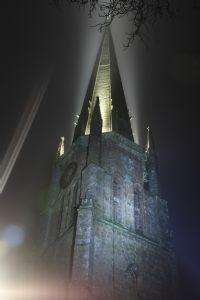 A donation of £10 will light the spire for a week. Please contact Dan Roberts (01295 720078) or the Vicar, click here to make email link. St Mary’s is a registered charity and can claim back 25p every time a taxpaying individual donates £1 to the church. This is called Gift Aid and further explanation is provided on the giving forms.